It’s been a couple of years since I last visited the Khutzeymateen Inlet. A situation I hope to correct in the new year. I may even lead a tour there next fall. Thinking about the Khutzeymateen, it’s easy to relive the bear encounters (for me, those can be seen at this link, this one or this one) as they can be intimate in a way that I find unique and mesmerizing. For whatever reason, I’ve been recalling the mists that rarely disappear in the valley. 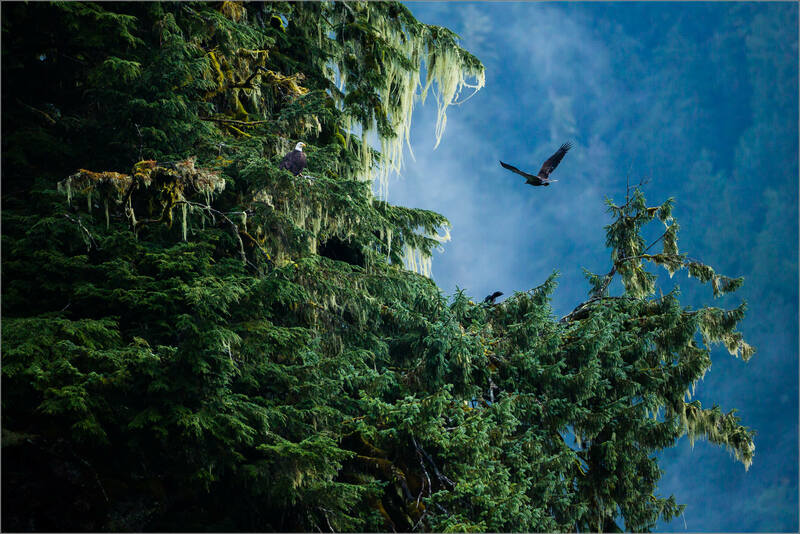 It clings to the trees as the wind and sun push wisps, walls and blankets of fog up and down the steep mountainsides. The continuous motion tears holes in these terrestrial clouds. The view changes endlessly as they drag across the landscape exposing islands of forest here and a rocky shoreline there. 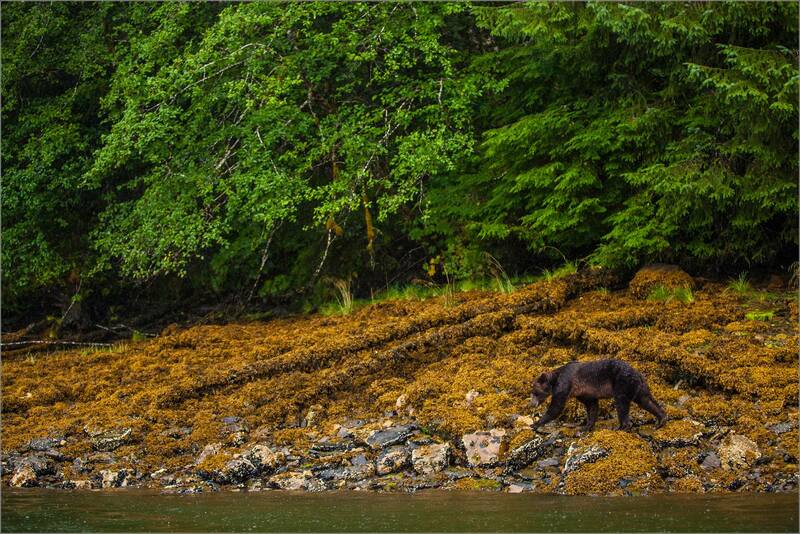 And, it certainly doesn’t hurt having these elements as the backdrop for bear photographs either! The theme for this year’s World Wildlife Day is listen to the young. I love this celebration of animals in their natural environments and a focus on the voices that will guide our future. 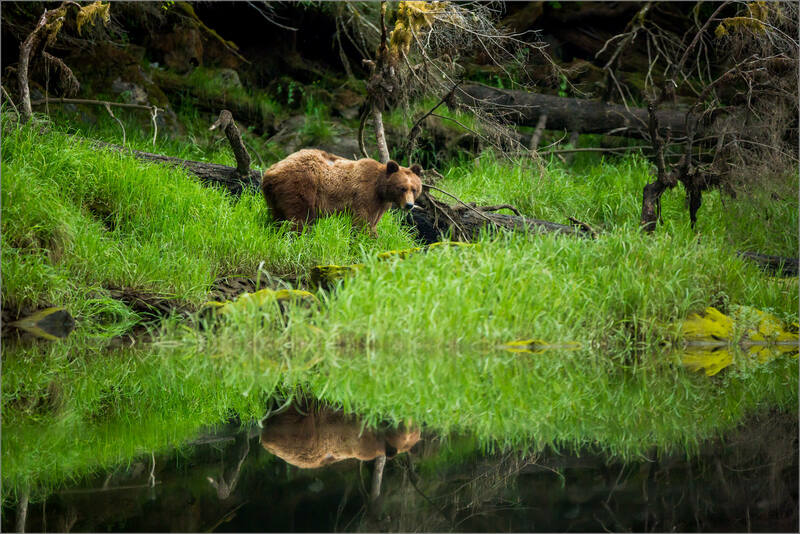 Thinking about this day and this theme, my mind went to the Grizzlies in the Khutzeymateen and the mothers who raise their cubs in this bear paradise. These images are from a couple of different mother cub pairs. When I was lucky enough to spend time with these bears, I loved hearing their voices. I hope my children are able to say the same when they are my age. 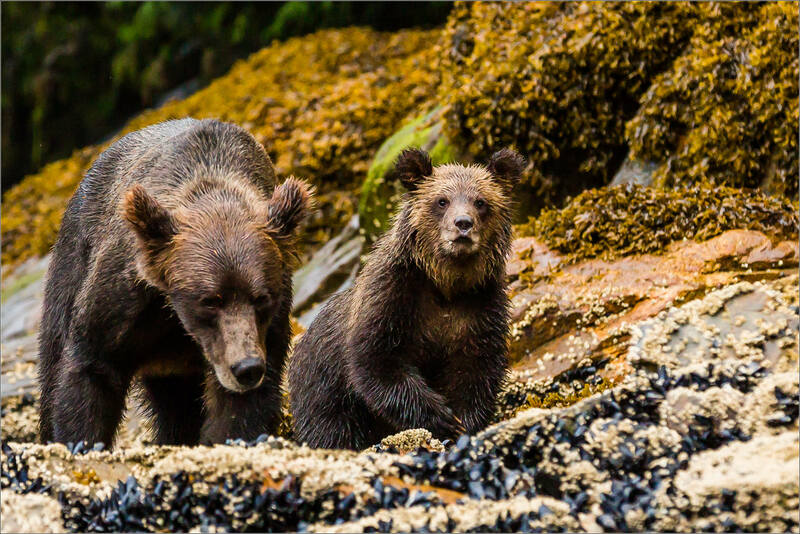 I hope to give both my children and the bears the opportunity to share their voice. I will always listen. 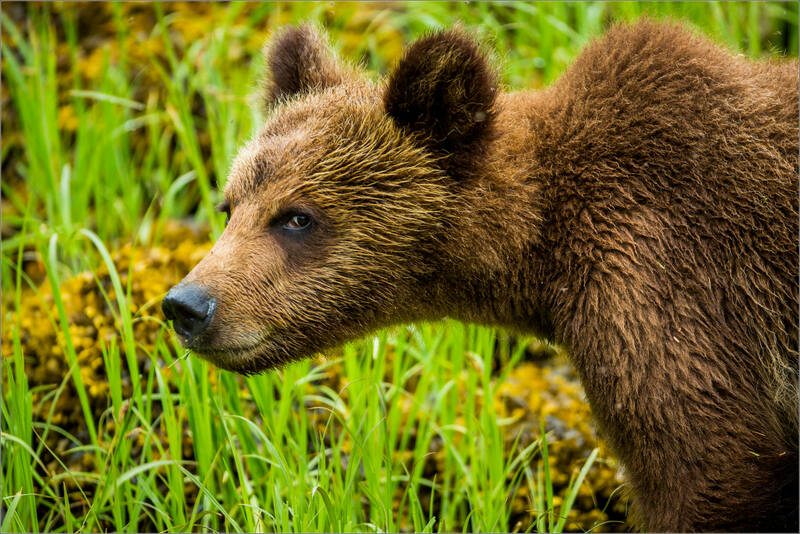 This young Grizzly bear cub was beautiful and proved to be curious, with a measure of caution, every time that we came across him and his mother when we were in the Khutzeymateen Provincial Park in June. 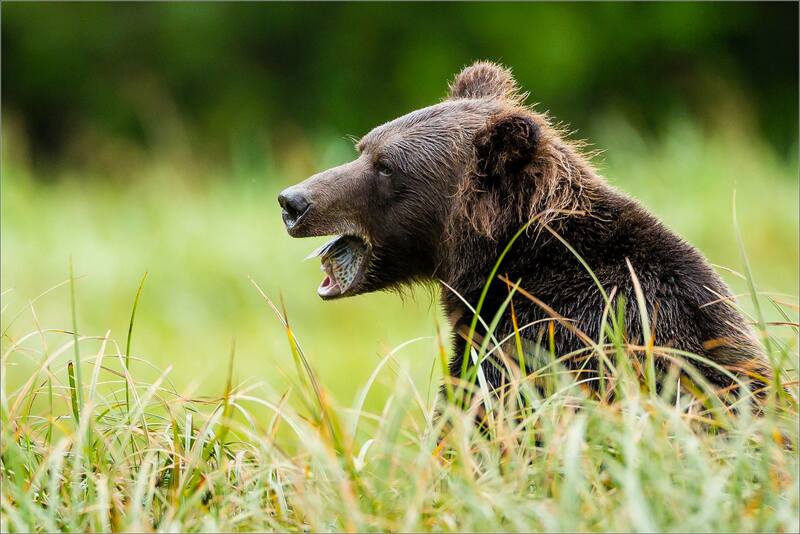 A Grizzly bear male watches from the tall grass of the Khutzeymateen Estuary. He looked to have been on the wrong side of a couple of fights judging by his beaten up coat. We were on a zodiac inflatable and he was on the edge of the river. We looked at each other, us six in our boat and him now on a log. He growled and huffed while swiping his claws across the tree bark. Then, having made his point, he turned his back on us, indicating that we were no longer worthy of concern and continued feasting on the sedge. 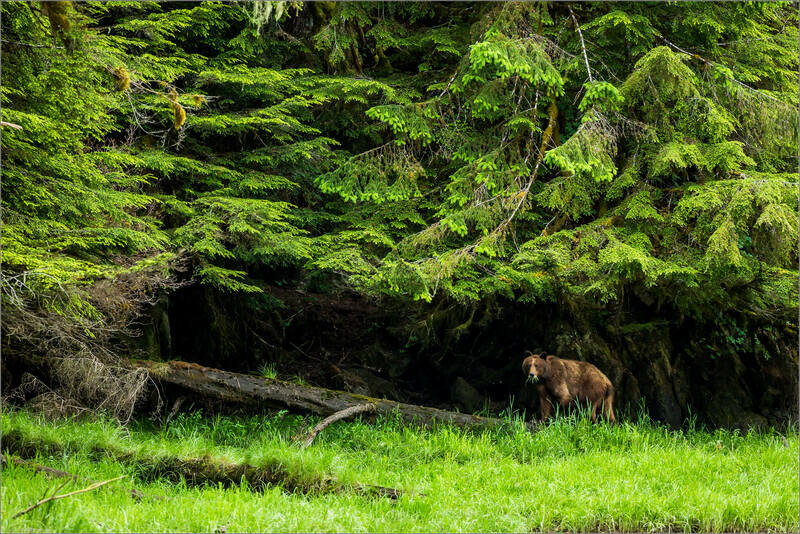 We watched him as we retreated and he wandered to the edge of the forest and then disappeared from view. 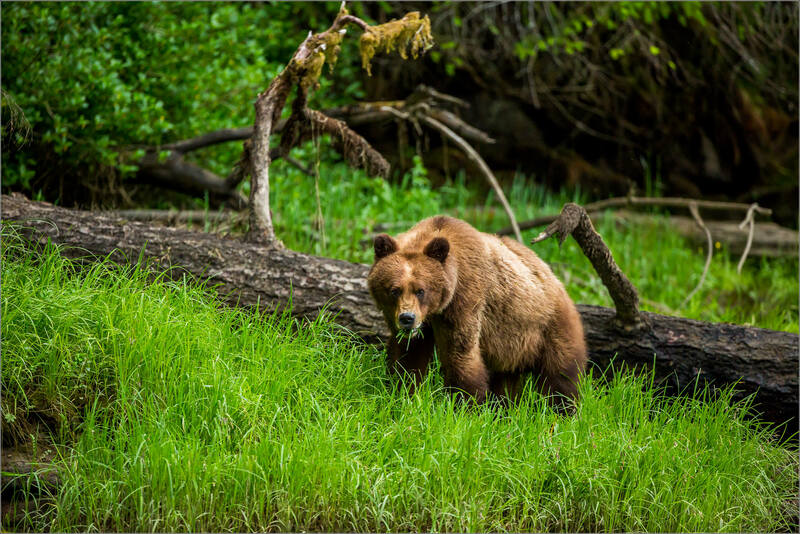 When the Grizzly Bears wake up from their hibernation in the mountains above the Khutzeymateen Inlet, the sedge grass is waiting for them. When Bobbi and I were there in June breakfast, lunch and dinner for them finds sedge on the menu. On this cold, wet morning this boar was one of several bears spaced out along the banks of the estuary at low tide mowing away. The volume, of grass eaten and sound created, were both very impressive. 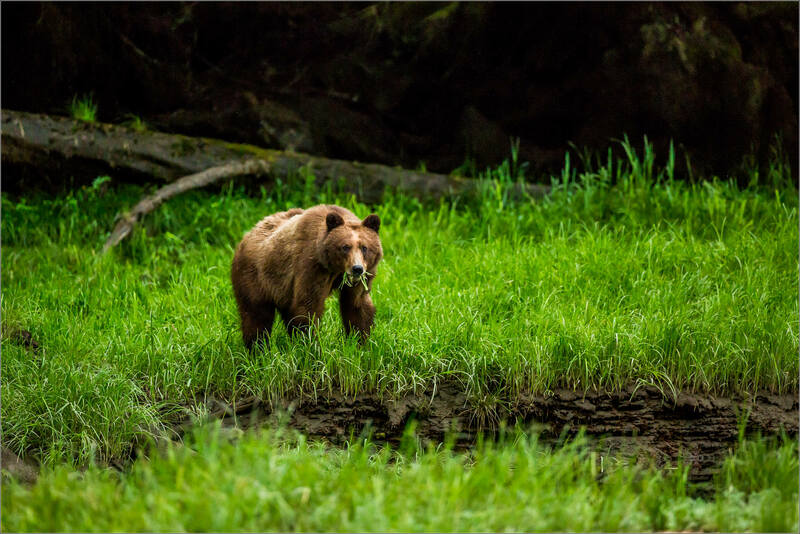 A Grizzly bear (Ursus arctos) mows down sedge grass grown tall in the estuary of the Khutzeymateen Inlet. This boar was pretty nonchalant when we came upon him as we rounded one of the river channels that divides up the grassland at low tide. He was sauntering along and sat down across from us to settle down for a snack. When he turned his head sideways to chew away, it created an unusual look at this handsome fellow and his impressive chompers. 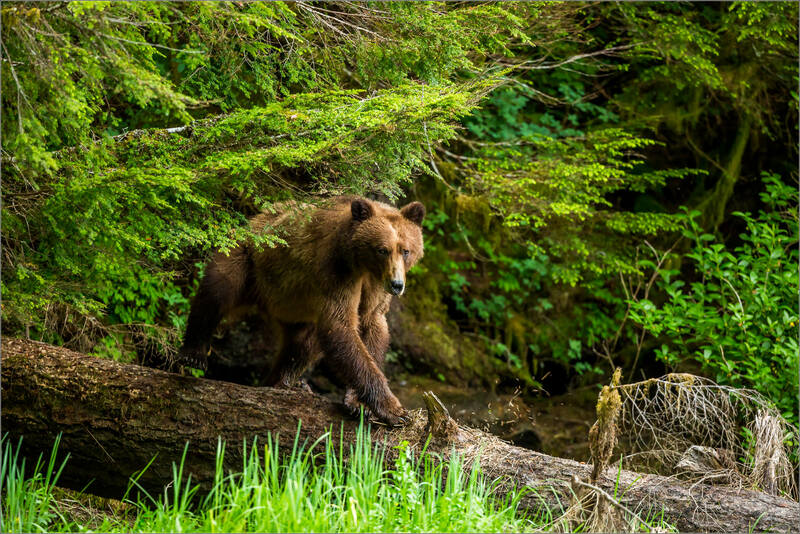 The four days I spent in the Khutzeymateen Grizzly Bear Sanctuary in August were incredible. 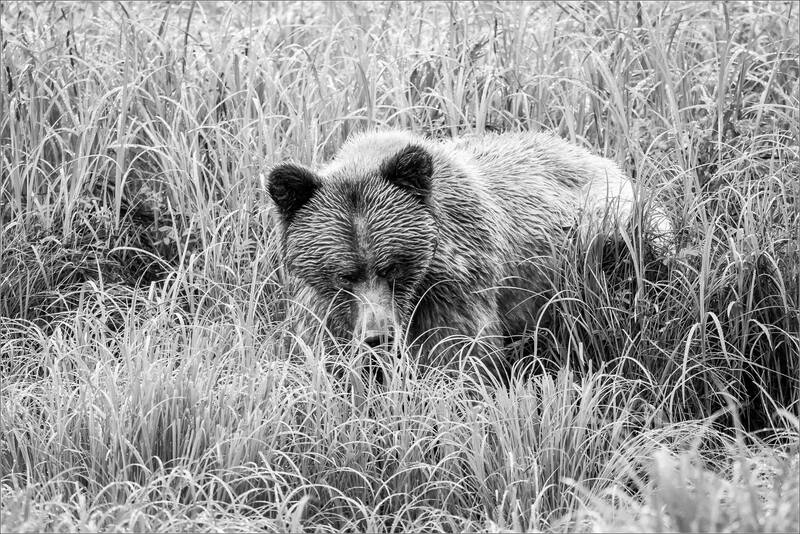 I’ve posted a number of images, bears and other wildlife, frequently over the two and half months since returning. From a productive photography perspective, the trip was a success by any measure. Alongside the images I came back with are the memories of individual encounters, the surprise of a seal popping up beside the boat as well of a pod of orcas transiting by at a distance and good deal more. I’ve saved my favourite bear encounter for the last. After a couple of days of heavy rain, the third day in the inlet was cold but clear. 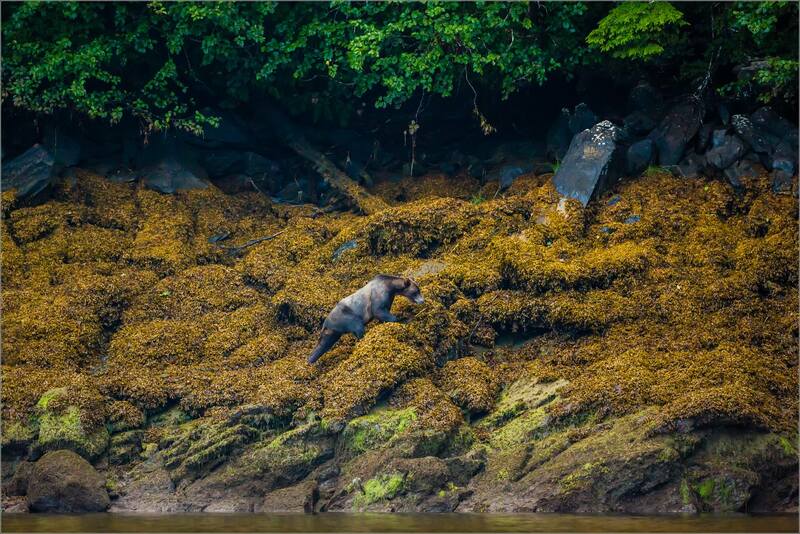 Not long after dawn broke we were in the zodiac floating at the mouth of a creek where the salmon were running up. 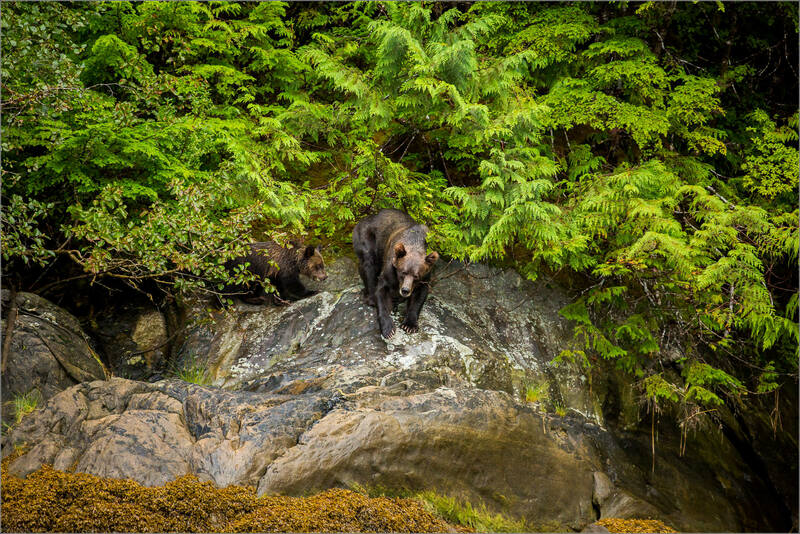 Along with a mixed flock of gulls, we were waiting in the hopes that a bear would materialize out of the rainforest and start fishing. A bit restless, I let my eyes wander along the shoreline across the water. On one sweep of the kelp covered rocks exposed during the low tide, I caught a bit of movement. Through a lens, I could make out an adult padding along eastwards towards the estuary. 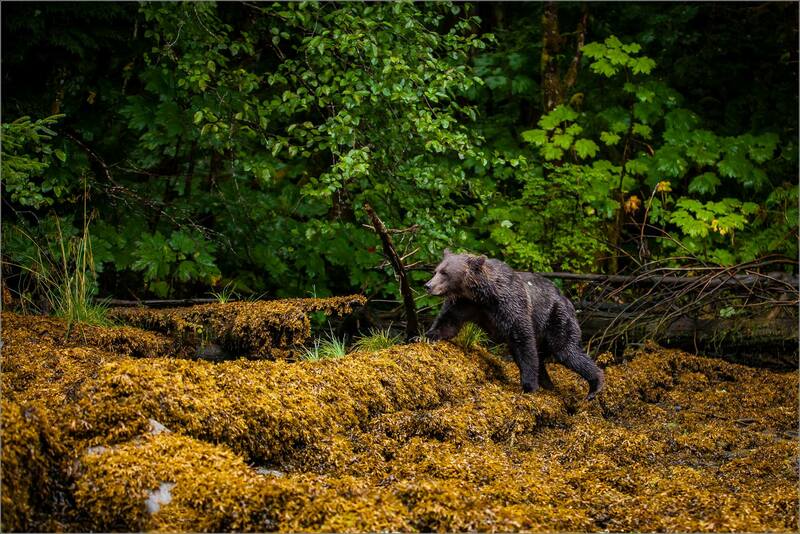 Drawing closer, we saw a second bear skip out of the dark shadows the forest still held on to. 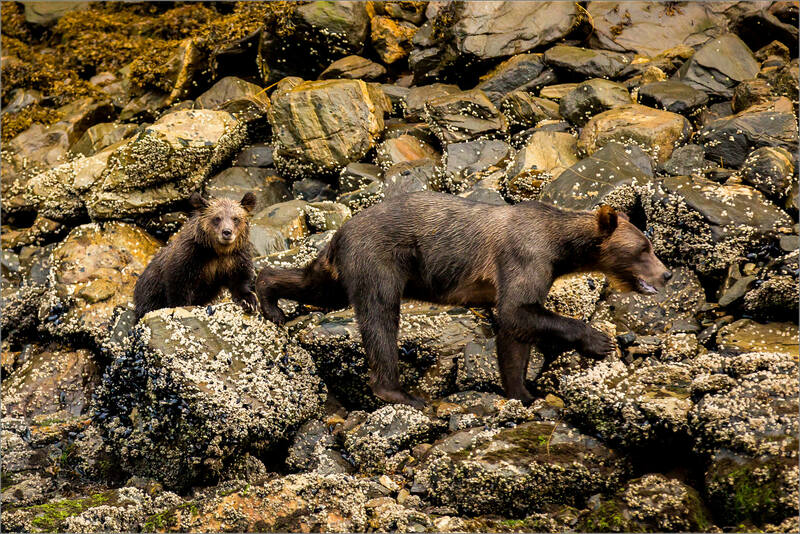 This ball of fur was a cub, a first year, and for the next hour we paralleled their passage over rock, under tree and across stony beaches. The mother was cautious when she heard the boat but Dan Wakeman, the captain of the Sun Chaser and our guide, has been in the inlet for the past thirty-five summers and as we pulled within twenty-five yards of the shoreline, she recognized her fellow resident and carried on with few second glances thereafter. The cub was far more curious about us than its parent was. A few times it pulled up, stared in the zodiac’s direction and huffed. Mom’s only notice of the behaviour came the times when there was too much huffing and not enough walking. At those times, she would huff and the little one would scurry back in step. They weren’t racing along the shore but it did seem that she had a place she wanted to be. Presumably it was the easy fishing grounds of the estuary at low tide. There was still time to stop and snack on berries in a heavily wooded chute. 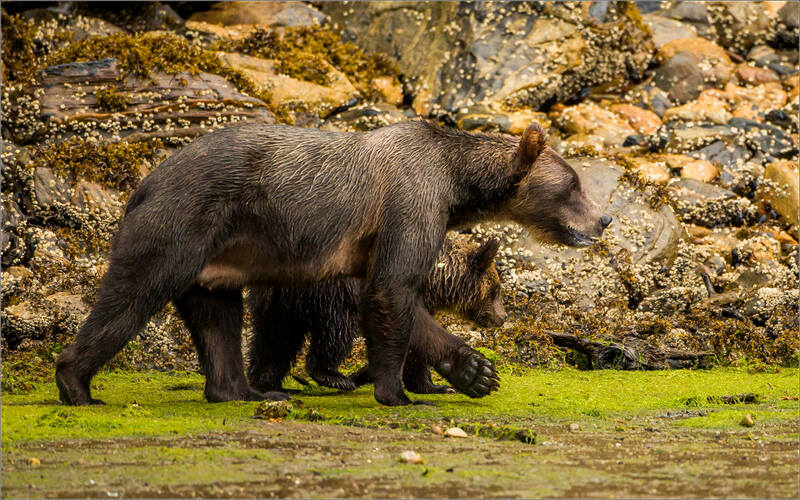 Mom may not have been worried about us but she was on alert for other bears. The boars can attack a mother and her cubs at any time so she would stop and have a listen, a sniff and a look now and again. There was no trail that they were following as this shoreline spends half the time underwater. The wet kelp, rocks and edge grass would have seen me sliding all over the place if I was covering the same ground. 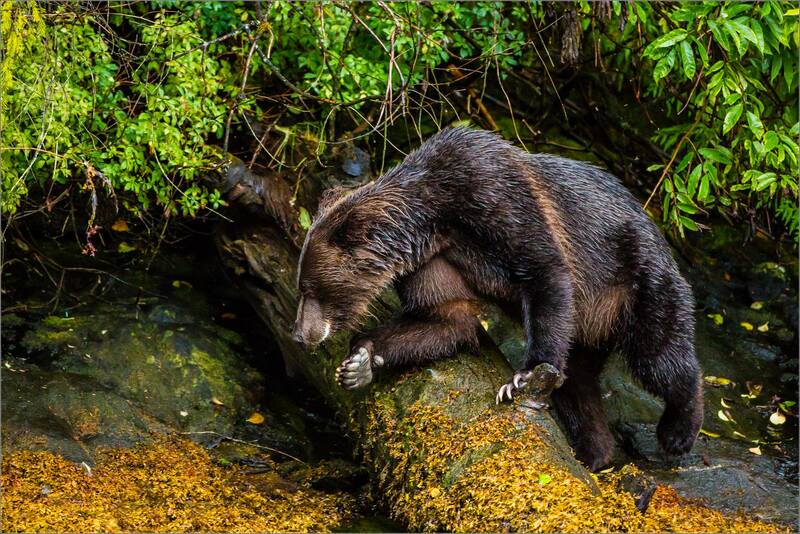 With their padded feet and surprising agility, these Grizzlies had few slips and little trouble navigating the terrain. They reached the estuary and moved down onto the beach above. From there they strode away towards the channels where the river was channeled with the tide out. 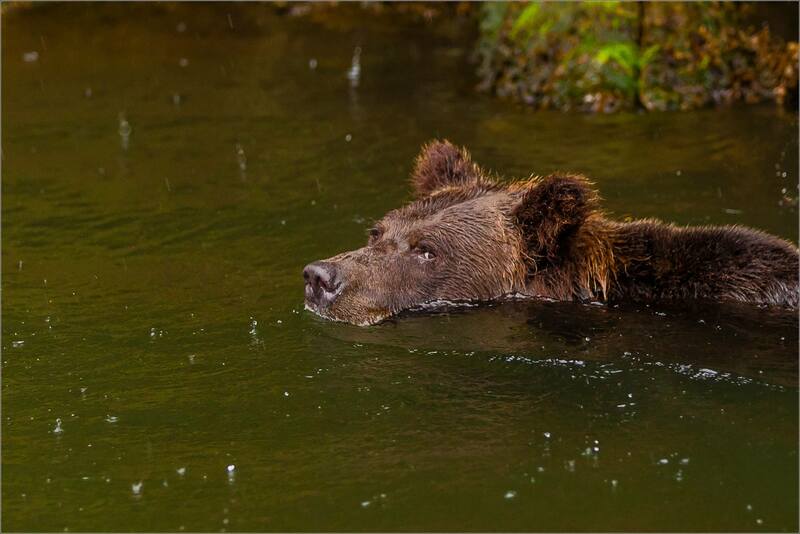 Salmon were surely on the menu. 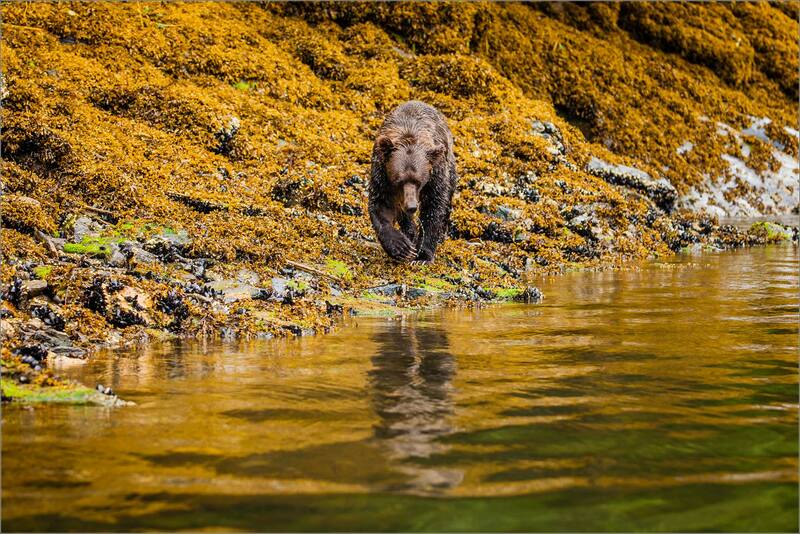 We crossed the inlet and there was already an understanding that this had been a very special encounter. 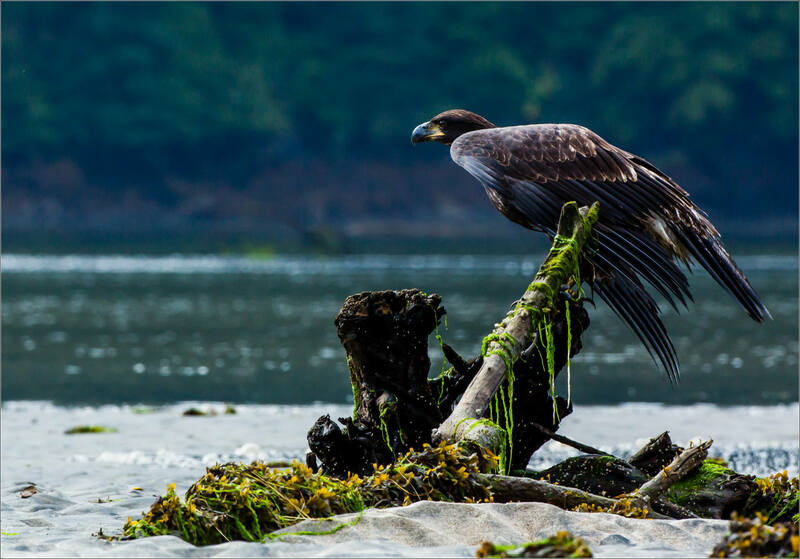 This is a small glimpse into the magic and majesty of the Khutzeymateen Inlet. 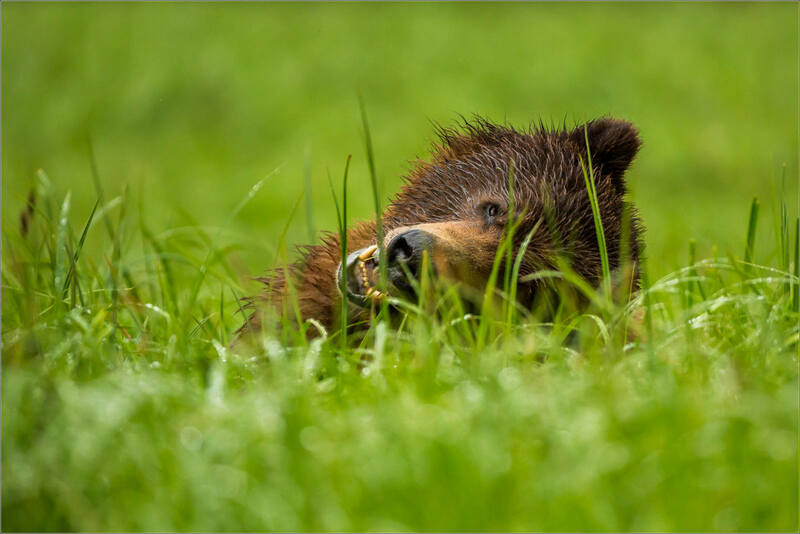 I will be returning in June to see the bears as they’ve emerged from hibernation and are busy eating the sedge grass, raising cubs and coupling up – I honestly can’t wait. 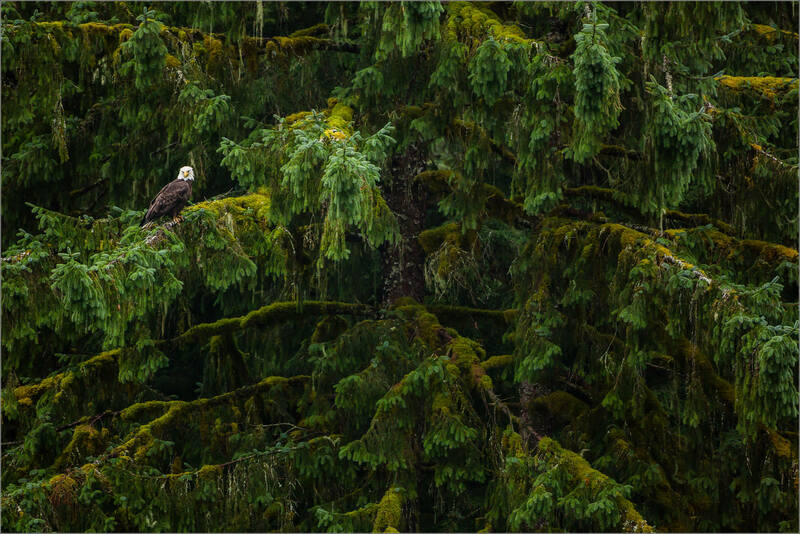 There was one additional encounter with a Bald eagle in the Khutzeymateen that I really enjoyed. The rain cleared on the evening of the second day and the weather was beautiful on the morning of the third day. We were crossing the inlet heading towards the side where the sun had just reached down the mountains to the shoreline. 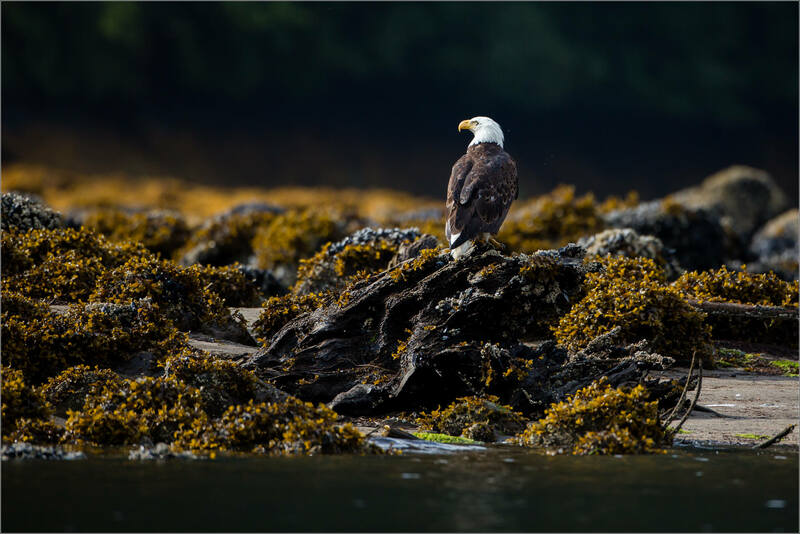 An eagle was lit beautifully as it perched on a rock exposed during low tide. 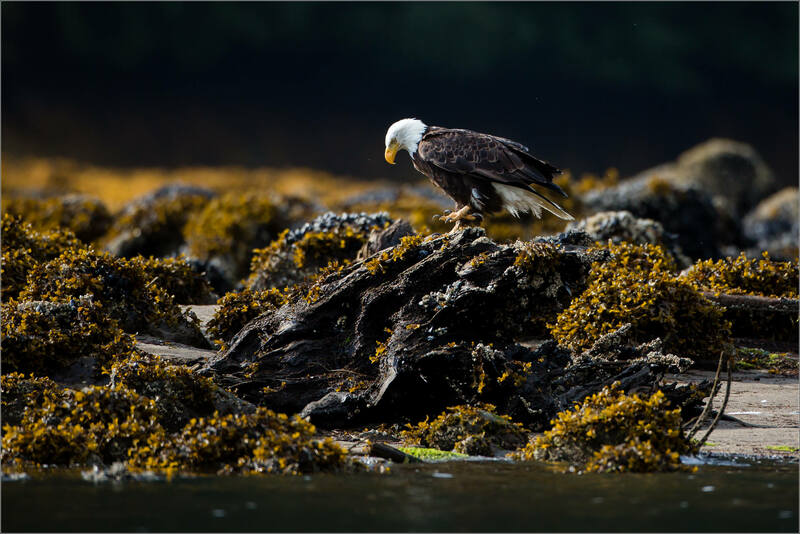 At first I thought it was watching the seagulls at the mouth of the creek it was perched beside. We watched it for a while as it surveyed its dominion. 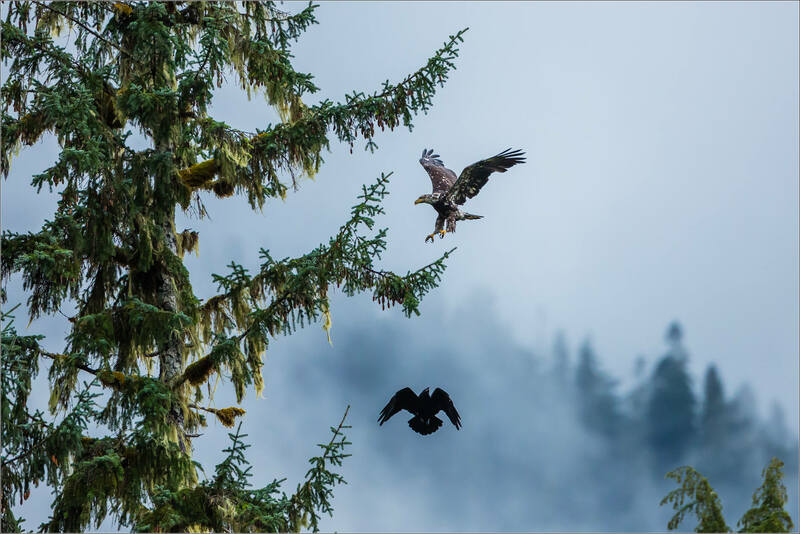 It seemed in no rush to join the fray as the gulls jostled for scraps of fish that floated downstream from a bear working on the salmon up in the creek hidden in the forest. 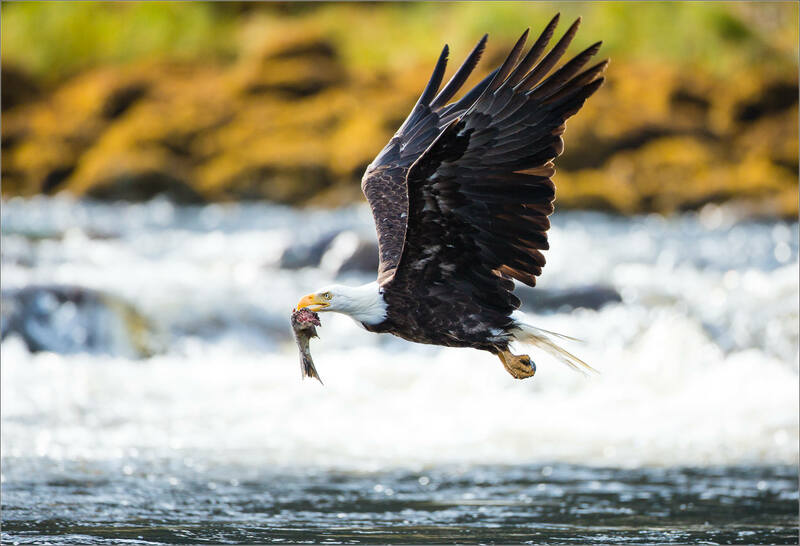 When it took flight clutching the tail end of a salmon in its beak that it had pulled out of a little nook, I realized it had been pausing between feasts. Watching it pass right in front of our boat, I had a few good images. 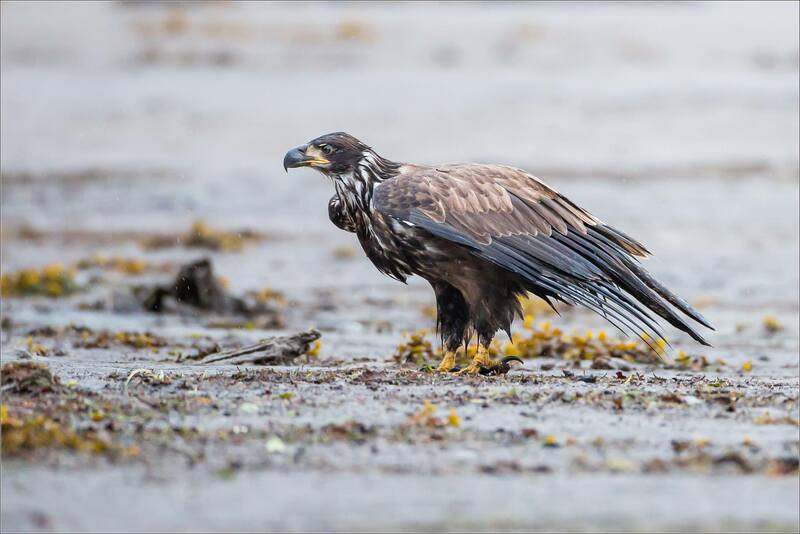 When it started to climb off the water, it passed the fish from to its talons, presumably allowing for more comfortable flight. I loved the light and the sense of place in the flight images. 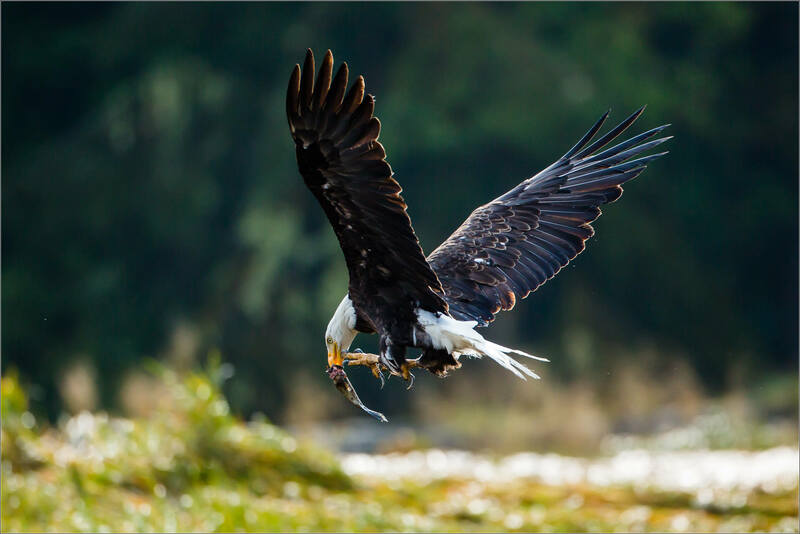 When the eagle passed the fish back, it was the defining moment of the encounter for me. 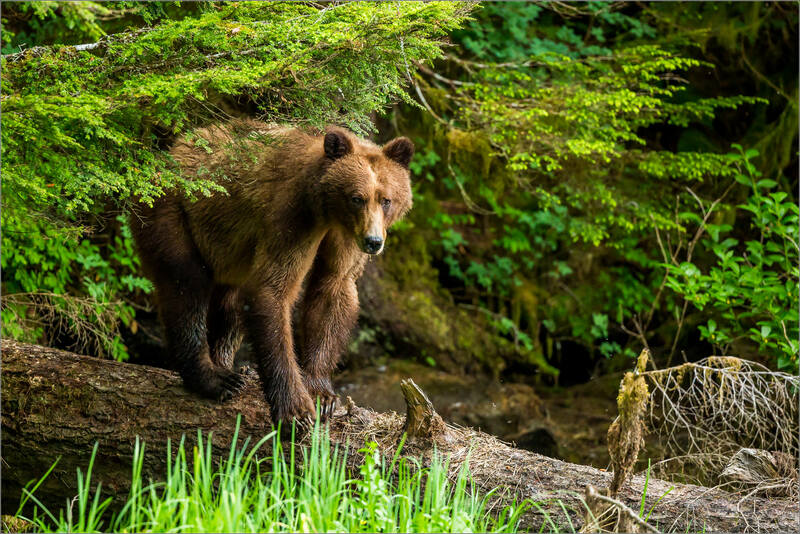 The Grizzly bears are the kings of the Khutzeymateen’s wildlife. 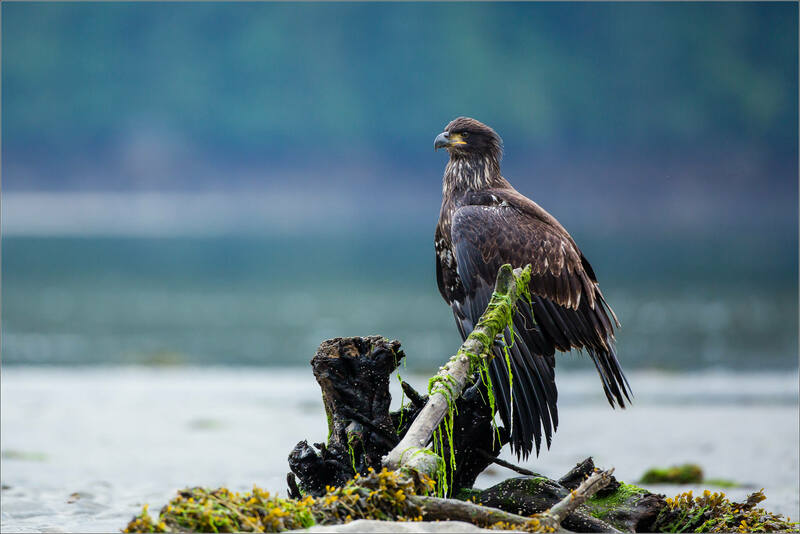 In the air, the eagles hold a similar position among the birds along the ten mile inlet. 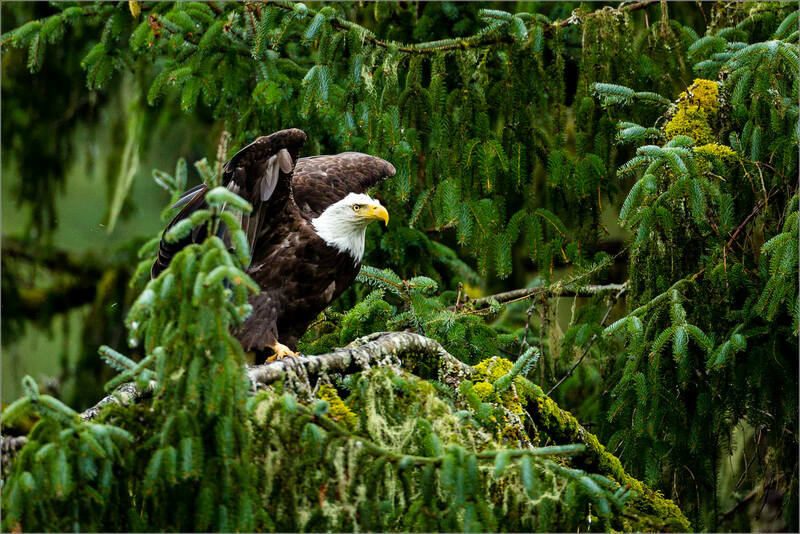 Most were Bald eagles but a few Golden eagles were also in residence to enjoy the salmon runs that were in full swing. 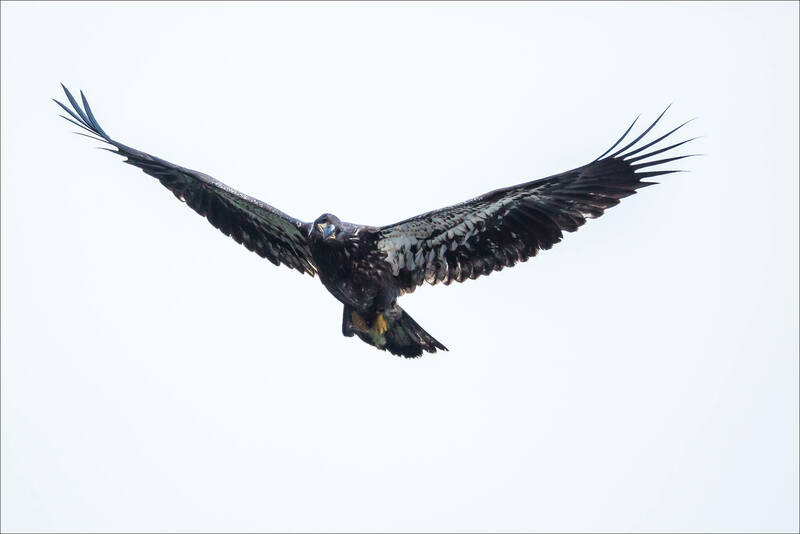 Constant adversaries on the prairies, eagles and ravens, were occasionally found chasing one or the other around the towering pines. 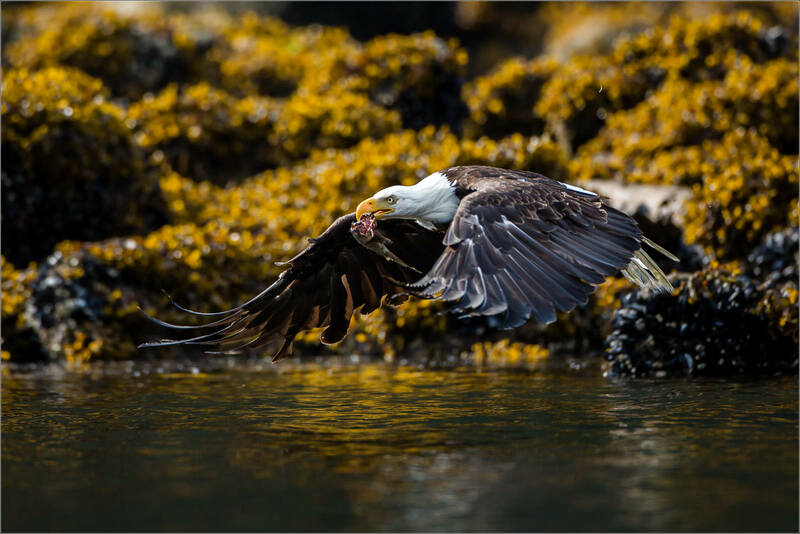 Often adolescents were dining on the fish in the creeks alongside the seagulls. That may have been much less trouble than jousting with their elders for the prime fishing locations at the mouth of the estuary. 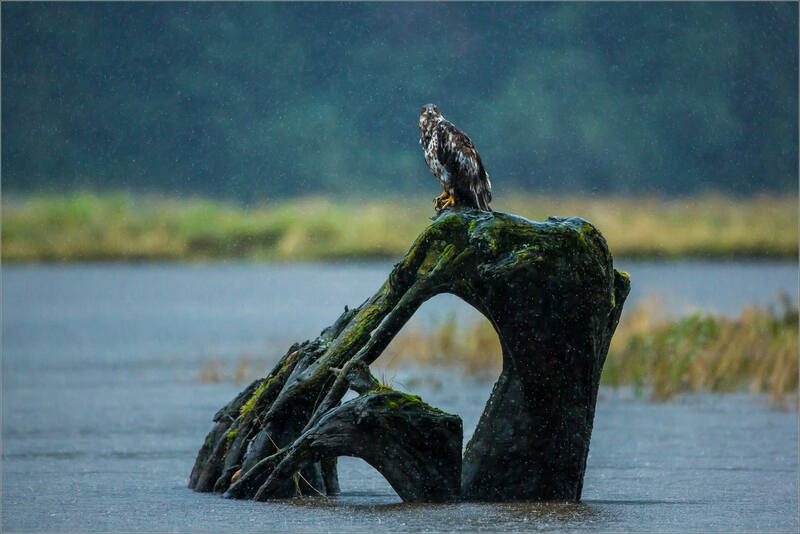 When the heavy rain would roll down the valley, most of the eagles would weather it in the open on a raised perch of one type or another. They probably don’t care too much about it but on the first two days where there were few breaks in the downpour, I thought there must be at least a few that hunted around for shelter. I didn’t find them but the exposed raptors provided a good subject when the bears were not to be found. When the rain did stop, the wings were unfolded to air dry and the daily activities resumed. 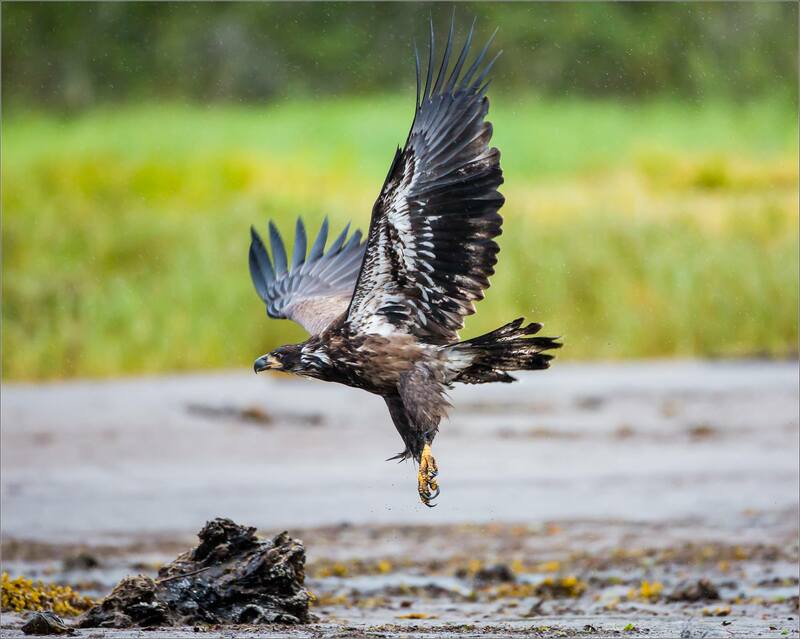 Photographing the eagles throughout the trip into the Khutzeymateen was one of the collective highlights. I’m fortunate to see them occasionally on the prairies but it was a real pleasure to be able to watch them along the coastline and up in the tops of the rainforest. 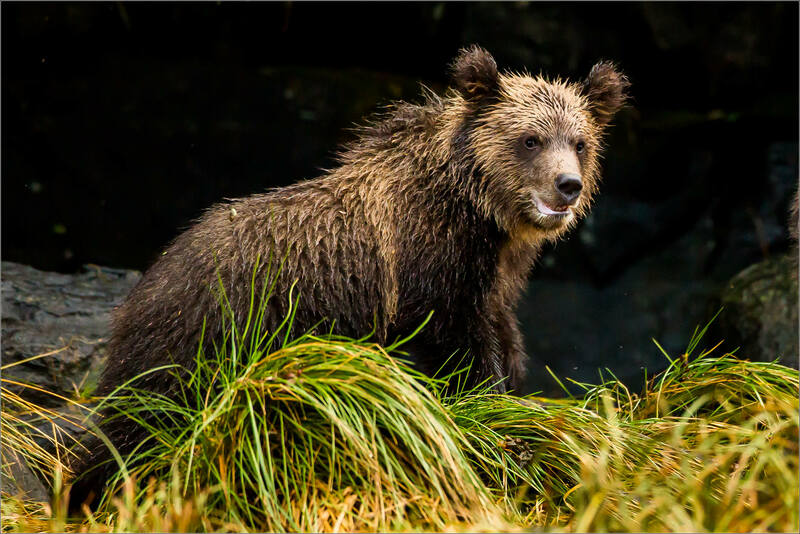 After having photographed the Grizzly bear named Blondie on the first day in the Khutzeymateen, we met up with her again on two separate occasions. Here she was at the mouth of the main river in the estuary. She had been in the water just before and the droplets were still shaking loose as she stepped across the sand. She noticed us right away but showed little interest and kept on her hunt for fish. She had swum around the grassy sandbar we were moored beside and carried on around another bend a few minutes later. After flying into the Khutzeymateen Provincial Park by float plane in the early afternoon, we moved all of our gear onto the Sun Chaser which was our base of operations for the four days spent in the inlet. The captain, Dan Wakeman, sailed us east towards the end of the inlet for a couple of miles and then weighed anchor in a beautiful little cove. We set up for shooting and hopped into Dan’s inflatable zodiac boat to look for bears. 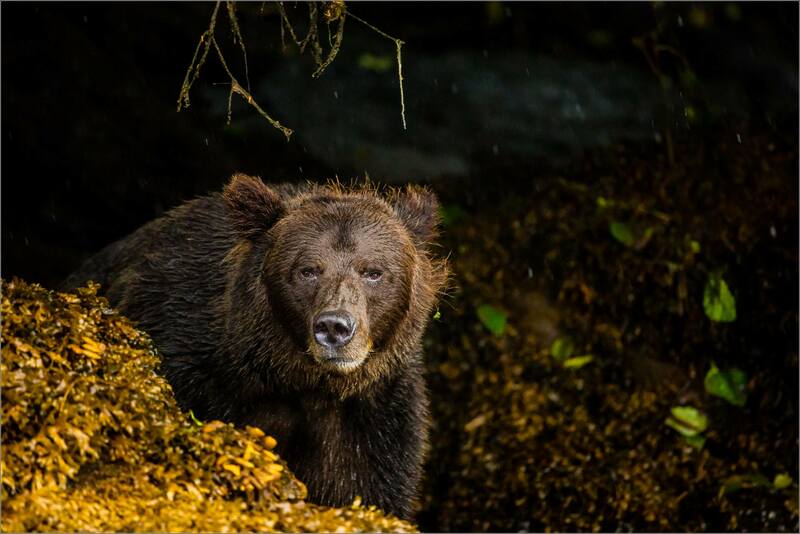 Earlier we had passed a river and watched a dark coloured Grizzly slip into the shadows of the rainforest. 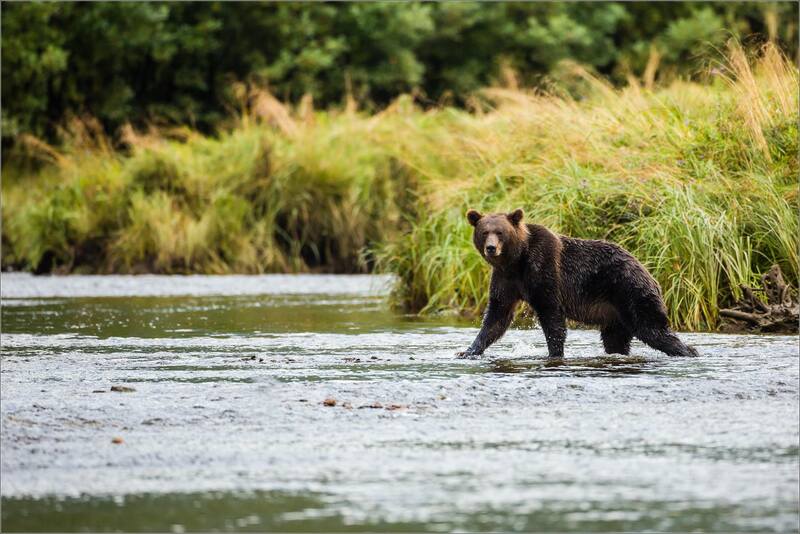 Now on a more mobile vessel, with shallow draft and a strong outboard, we headed back and went upriver about one hundred metres to see if the bear had lingered in the area. It did not reappear and we soon headed down to the estuary and the main river flowing out of the mountains there. We waited and watched but found no bears on that first visit to the head of the valley. I didn’t mind, the scenery was beautiful and I enjoyed building a familiarity with the land. 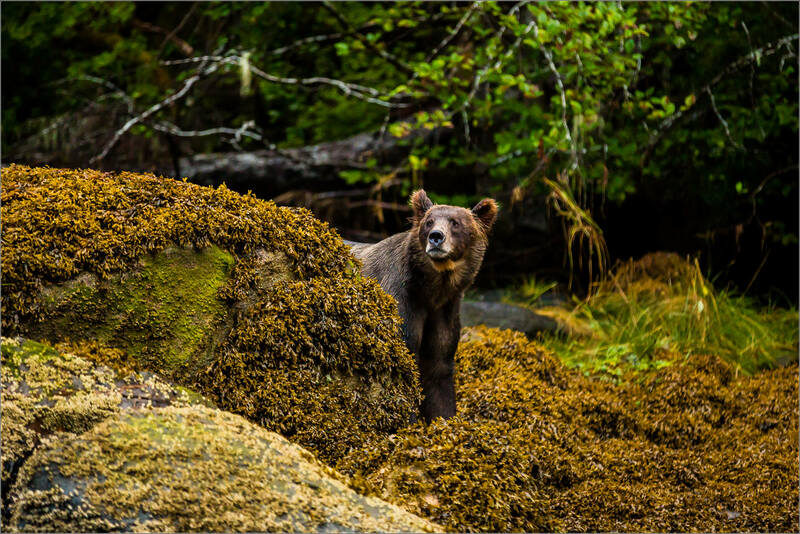 Dan has spent the non-winter months of each of the last 35 years in the Khutzeymateen and it was a great to soak up some of the knowledge he freely shared as we trolled around and watched for wildlife. 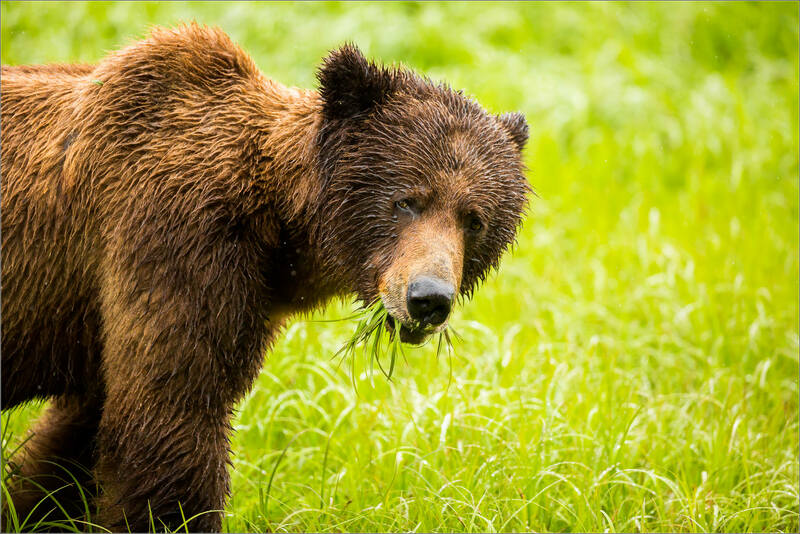 We headed back to the Sun Chaser and spotted a female Grizzly who was picking dead salmon out of the sedge grass. They get caught in there during the high tide when the meadows are covered and having spawned do not have the energy to untangle themselves. 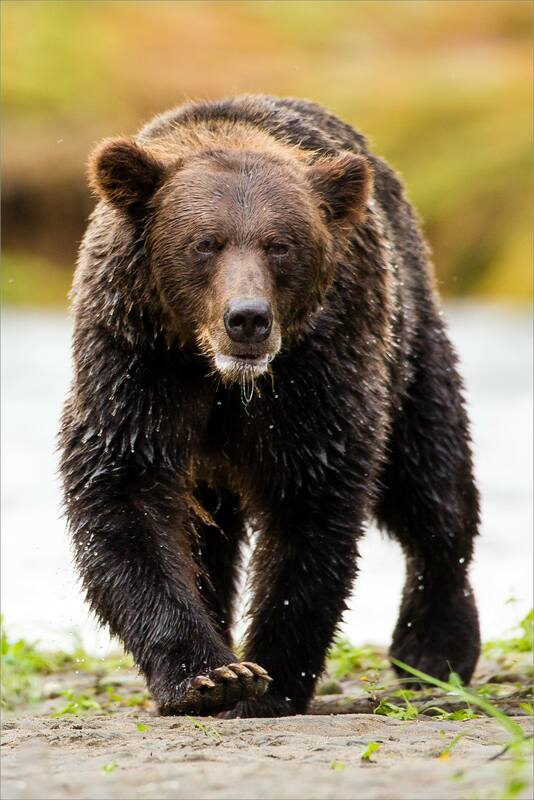 With the Grizzly finishing off a fish, Dan introduced her as Blondie. As I mentioned in an earlier post, she had been blonde as a cub and a few long tufts of hair behind her ears had stayed with her into adulthood. She hunted in the grass for a bit longer and then went fishing in the river. 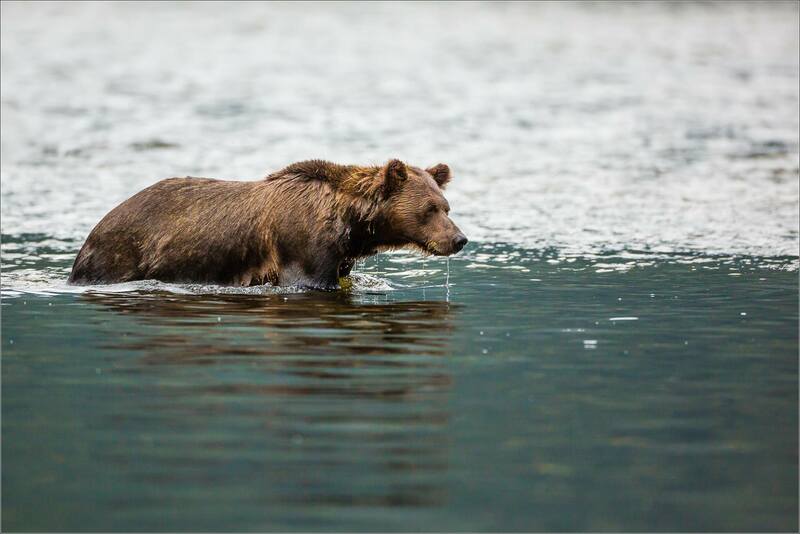 She splashed around a bit but pretty quickly headed to the grassy field on the far side and resumed looking for salmon there. She paused frequently to smell the air. Lifting her nose up and looking around it seemed likely there was another bear in that area, perhaps the dark bear seen earlier. 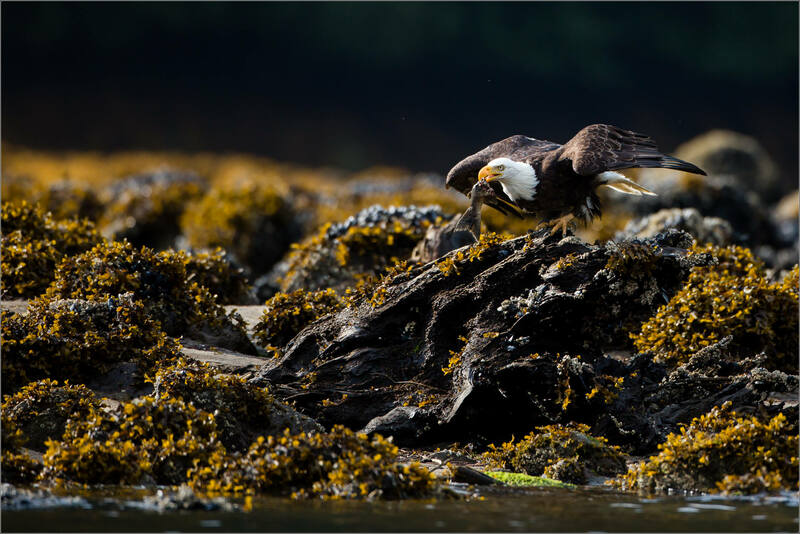 She was wary and Dan was not surprised when she pointed east and left the grass for the slippery rocks exposed during low tide. 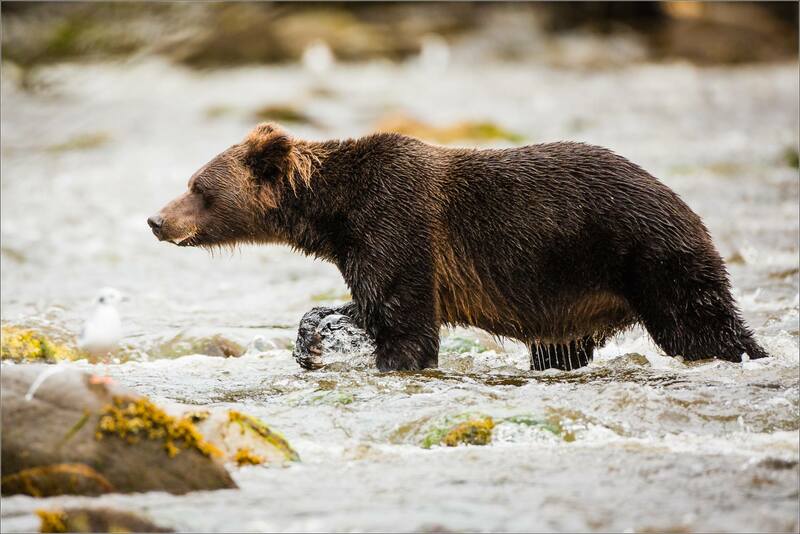 She was heading for the estuary where the majority of the salmon run and the hunting can be very productive for the bears. With the full moon pushing and pulling water down the long Khutzeymateen Inlet, there was a difference of six metres between high tide and low tide. When the water was up, it came right to bottom branches of the trees on the edge of the rainforest. 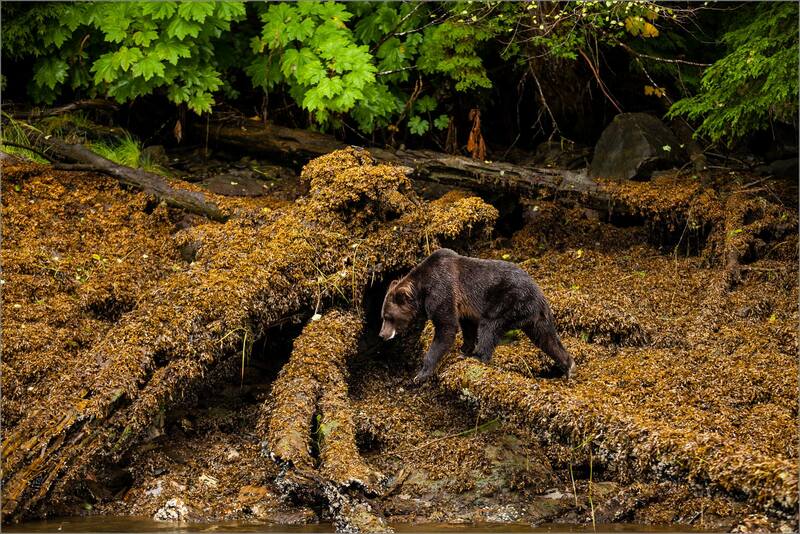 When it is low, many of the bears use the easier path along the exposed band of lichen and kelp covered rock to cover ground. With rain now moving from a drizzle to a steady downpour, we settled into a rhythm with Blondie paralleling her as she walked and swam along the coastline. We moved with her for the better part of an hour. She disappeared into the forest in a couple of impassable spots and then re-emerged again. Twice she slipped into the water and paddled along that route for a while before making landfall and carrying on. 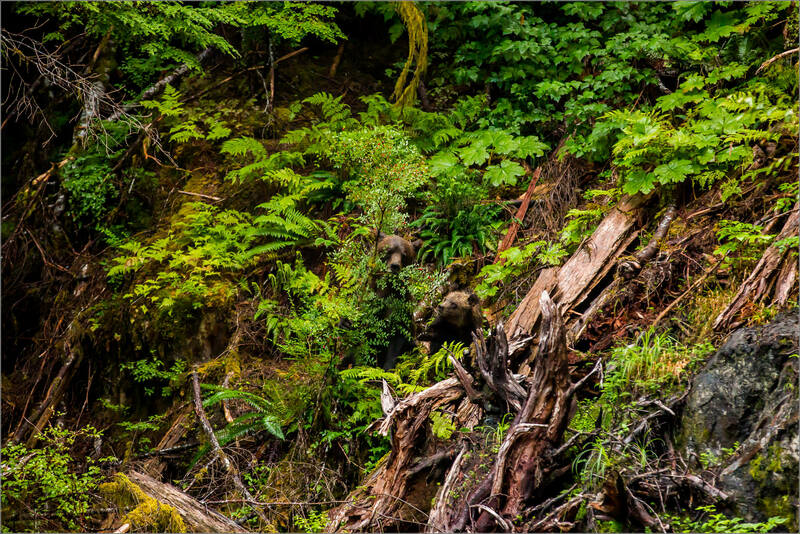 This was an incredible opportunity to watch a Grizzly bear move through her environment at her pace, undisturbed by us due to Dan’s understanding of this population and this specific animal. We met up with Blondie again a couple of days later and I will share that story in another post. At the next meadow of sedge grass she pawed at the ground in a couple of places, sniffed at the air a couple of times and then walked into the trees to a trail that Dan has seen which leads to the estuary still a mile further down the inlet. We parted company and returned to the Sun Chaser for our own dinner.